SpringStar (Seattle, WA) visited CVB 28-29 October for meetings to discuss their Option to License for the center’s pyriproxyfen autodisemmination station. Topics included research progress review, station design, formulation, ease of manufacturing and EPA registration. If all goes well, the station will become a commercial product in 2016. The SpringStar representatives also stopped at Mercer County Mosquito Control to visit the field test plots with CVB member and collaborator Dr. Isik Unlu. 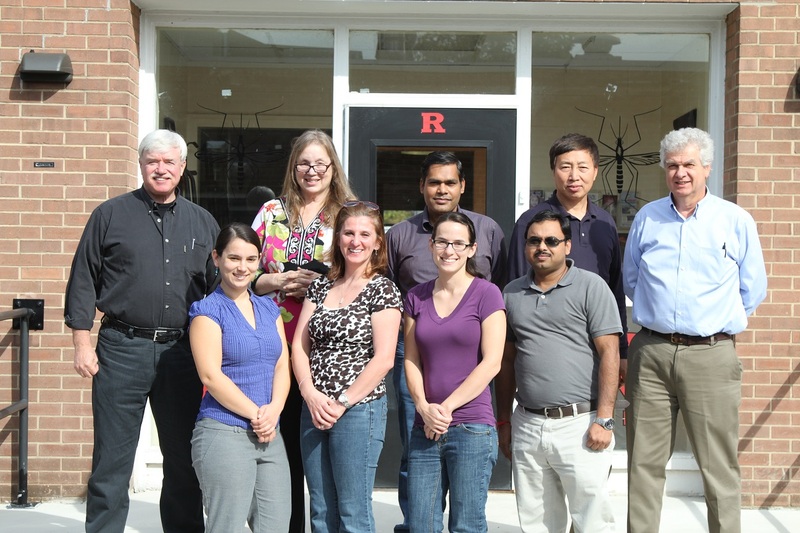 Top Row: Drs Randy Gaugler, Lisa Reed, Kshitil Chandel, Yi Wang, Michael Banfield (SpringStar) Bottom Row: (SpringStar), Isik Unlu, Elizabeth Schaafsma (SpringStar), Devi Suman. For more information on autodisemmination and using mosquitoes to deliver control agents, see the publication Wang Y, Suman DS, Bertrand J, Dong L and R Gaugler. 2013 Dual-treatment autodissemination station with enhanced transfer of an insect growth regulator to mosquito oviposition sites (238k PDF) Pest Manag Sci: DOI 10.1002/ps.3702. This entry was posted in Uncategorized on October 29, 2014 by Lisa Reed.